Let me start off by saying this: my first car is still at least two years off, but I’m thinking about it already because I’m a car enthusiast. The original plan was just for me to get my mom’s 2009 Honda Odyssey, but my dad had a great idea that makes a ton of sense for everyone. Here’s my dad’s idea: sell the Odyssey, since it’ll be worth 7 or 8 thousand dollars in a two years time, and use about $5,000 to get me a car with a manual transmission for me to learn stick on. The rest would get out towards getting my mom a new car. My dad is totally on board with the idea and wants me to learn manual, but my mom isn’t so sure yet and wants me to keep the van for its practicality. I’ve still got two years to convince her that I don’t need 90 cubic feet of cargo space and 8 seats. The question becomes, what would I get instead? 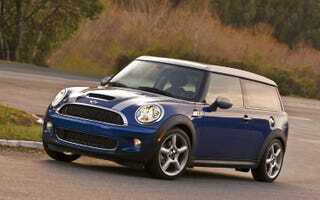 My dad likes the idea of Mini (hence the Clubman above) because it’s fun, manual, cheap, and I fit in it. So what say you Oppo? What $5,000 manual used car is best for a very tall (6'9") driver? Should I just keep the Odyssey instead, with its automatic transmission?